[VIRGINIA, DOGO, LTTW] I’m annoyed with myself. As a musician, I feel the need to have everything in advance—a fine instrument, first-rate sound system, and comfortable studio—to be able to let out all my creativity. This is not entirely wrong, but what annoyed me the most is the way my mentality goes: when I have a little, I’ll only achieve a little. I had been forgetting what I actually have and why I should be grateful for: my own hands! I could never have imagined if I’m loosing one; probably I would hide and lock myself from the world. Honestly, I don’t know if I can survive like those who were born with disabilities. While in fact, there are some of them who even go beyond surviving and inspire the world. The 19-year-old George Dennehy is surely one of them inspirations. He was born without arms in Romania, and adopted by U.S. Family at the age of one. “It was rough in the first years of my life, but I lived.” He said in a short film of I Like Adoption. It was his new parents of Michael and Sharon Dennehy from Ashland, Virginia, who stood out for what he is. They knew that George is unique, just like any other kid in the world. They also believed that the culture they live in is practicing equal rights, where everyone has the right to earn what they want. 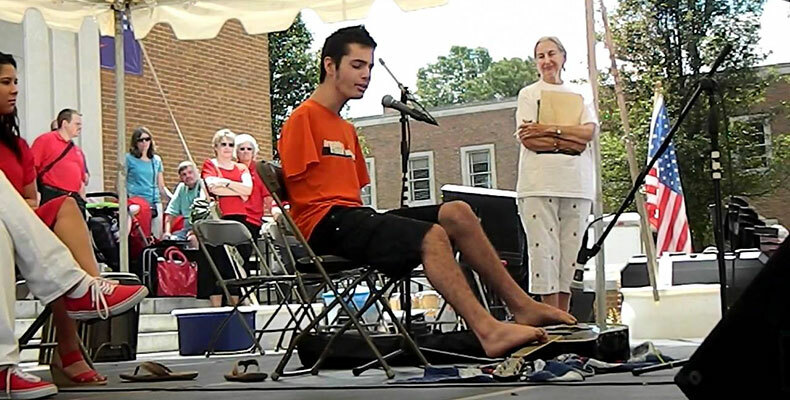 In this case, George has shown some musical interest, so his disability shall never be an excuse. Since then, so much has happened for him. Here is his short list: he started by taking cello lessons (yes, with his feet). He championed guitar. He is also playing with electric bass and a bit of piano. He won “Richmond’s Got Talent”. He was appearing live with his favorite band the Goo Goo Dolls. He writes music. Now he is engaged to a beautiful girl. In a few words, his life is good. George’s story has slapped me hard in the face. Reality bites, but he bites back. But I wonder, what made him capable to do such things in the first place? Is it his disability? Is it the power of music? Is it his love and passion for music? Or is it simply his strong-will? Let’s go back to what I have: I have both my hands, I thank you God. I can strongly feel the power of music. And I think I am very passionate to music; but Strong-will? This I don’t have. Even if I do have it, definitely it’s not as much as George’s. In his case with cello, I am very aware that it is not an instrument that ‘easy to live with’, even with arms. Yet, with the support from his music teacher, George has proven himself that he not only can play, but champion such challenging instrument. I know I can’t. In other cases, we have also known inspiring individuals with physical limitations as Dame Evelyn Glennie, Stephen Hawking, Frida Kahlo, Hellen Keller, and so on. We even have paralympic Games! So I guess I’m blurring myself with what I have, and what I should have. I am too scared of loosing my hands, my instrument, my studio, but I am hindering my own will. Look who’s disabling now.